I am extremely privileged to become the new assistant principal at Cason Lane Academy. I look forward to joining the Cason Lane family to partner in supporting students with opportunities to reach personal and academic success. I am overjoyed to be reunited with Murfreesboro City Schools. 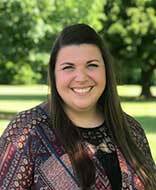 I began my teaching career at Hobgood Elementary School, where I served as a 5th grade English Language Arts teacher, a 3rd grade teacher, and an academic coach. I have recently supported the Tennessee Department of Education as a Regional Reading Coach Consultant, building literacy achievement and growth throughout the South Central region of our great state. I am honored to be welcomed back to Murfreesboro City Schools- a district I consider my home. I earned a Bachelor’s Degree in Interdisciplinary Studies K-6, a Master’s Degree as a Reading Specialist, and recently an Educational Specialist Degree in Administration and Supervision from Middle Tennessee State University. I ground myself in being a lead learner with a thirst to always know more. Education is the key to unlocking a world of endless knowledge. As an educator and leader, I am passionate about building strong relationships with students, teachers, parents, and the community to create successful paths for each student we serve. My goal is to be an active participant in the learning and personal lives of all Cason Lane Chargers!